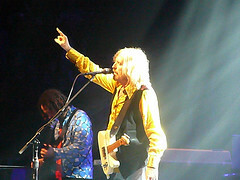 Third show into the tour and it was very apparent Tom Petty & The Heartbreakers are happy to be in Toronto. After the great show Steve Winwood put on we were ready for Tom Petty and we get 2 hours worth with lots of hits and some cool rare stuff. From the first chords of the opening song You Wreck Me, we were on our feet and Tom was smiling and laughing was encouraging clapping and singing. We get Mary Jane’s Last Dance, I Won’t Back Down and Even The Losers before we take a breath!! I have to say the stage design was really outstanding. There were these 5 “branch” like metal beams that come up from behind the stage and hang over the band. On each “branch” hung a square grill that seemed to be covered in LED lighting but could also play video. The video image could wrap the square and there were lights inside the squares. Believe me my description doesn’t do a thing for this state- of- the- art setup. 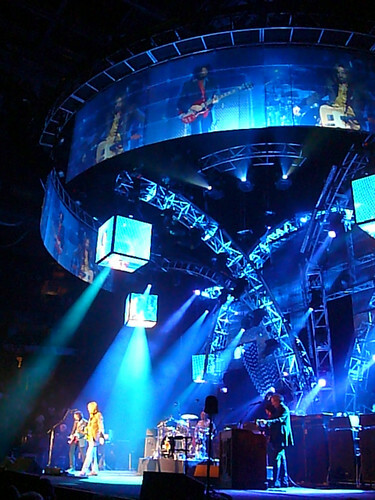 How much better concert value can you get for 130 bucks? A true rock legend opens for a rock legend. It was so nice for change to see the floor almost full and the upper and lower bowls pretty packed for the opening band. 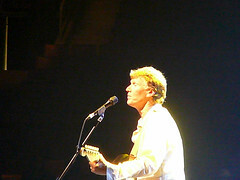 Steve Winwood came out in his loose white un-tucked white dress shirt and with a jaunty wave promptly sits down at the keyboards and plows into some new material from his recent release Nine Lives. I hadn’t heard any of the new material but after hearing the first 2 songs I understand why the CD is doing so well in Europe. The songs had a blues / jazzy / rock sound. I can’t say for sure but I think 1 was a song called Dirty City, which had a gorgeous prolonged instrumental that took us out there for what seemed like 10 minutes. How many great Traffic tunes had instrumentals? Answer: all of them. Do you remember Rock & Roll Stew? Percussion throughout the set was outstanding. There seemed to that almost ethereal bongo sound happening / reverberating throughout. The band overall was excellent. There was a sax player and some point a flute was being played. There were 2 drum kits up there aside from the Petty kit and the second got the workout in latter portion of the set. I felt that the volume in the first half of the set could have been higher. That would be my only complaint. I guess rock legend or no rock legend the opening band doesn’t get full sound system benefit. Steve politely stated he would be playing songs from his past along with new material and mentioned the new album by name. 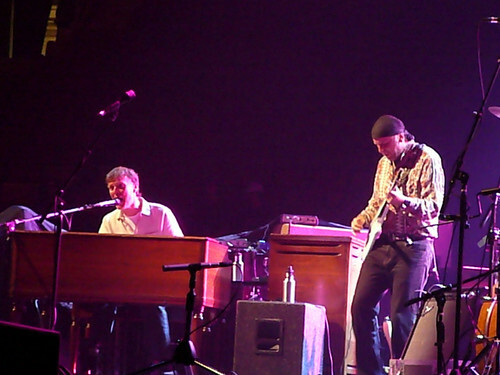 He let everyone know they were in for a treat with Tom Petty and then he went into playing Blind Faith‘s Can’t Find My Way Home (most seats were full by this point – if a Blind Faith tune can’t get you to watch Steve Winwood – go the f**k home) and Traffic’s Dear Mr. Fantasy. This was easily the highlight for me. Both tunes featured Steve’s excellent work on his pale green fender stratocaster, especially on Dear Mr. Fantasy. This song also got the biggest crowd reaction with a nice standing ovation at its conclusion. Steve fit in a Spencer Davis Group tune I’m A Man that received a kind and very respectful audience reaction. It came across as a ” yeah… you were amazing even when you were 15 years old”. Steve played a good hour and a bit finishing with Higher Love from Back in High Life and Higher Ground, a song he originally did with Stevie Wonder a while back. 2 excellent songs to finish out the set. 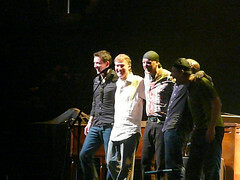 Steve Winwood and his band take their bow while receiving another much -deserved standing ovation. I heard all the Winwood stuff through the 80’s and 90’s Arc Of a Diver, Back In The Highlife, Roll with It. His music was always there you know on radio in the background somehow but not like Traffic was for me. Traffic was gift from my late older brother who turned me on to all kinds of great music. Music was a place we shared. Tim was very much present with me last night when Steve was playing. See you in the front row….